Toxic waste is, well, toxic. It comes as no surprise that it can therefore be extremely harmful to humans, animals, and plants. This was demonstrated in the late 1990s movie A Civil Action which centered on a lawsuit brought by a group of Massachusetts families whose children had died from pollutants in the water. Unfortunately, the movie was based on a true story. The silver lining is that the families were able to recover a substantial amount from the responsible party. Toxic waste also happens right here in Florida. The News-Press recently reported that a class action brought by a group of Fort Myers residents against the city for toxic sludge will not be dismissed. The lawsuit alleges that the city allowed a South Street landfill to remain contaminated with arsenic for decades in the residential area. Neighborhood children have reportedly played in the toxic sludge over the years. The residents are seeking a court-ordered cleanup of the landfill. Toxic waste victims deserve to have their day in court and recover compensation from those who are responsible for their injuries. The experienced personal injury attorneys at the Pendas Law Firm have helped many people in this situation and can help you too. This term encompasses a broad range of materials that share the common trait of posing a significant threat to people, animals, and plants. What is the Law Governing the Disposal of Potentially-Toxic Waste? Just a few decades ago, there was very little legislation in place dictating how to properly dispose of toxic waste. Fortunately, in today’s world, the disposal of hazardous waste is governed by the Environmental Protection Agency. Even toxic waste that is disposed of in a landfill designated specifically for it is required to be handled with a certain standard of care. What Are Examples of Places that Toxic Waste Can Come From? Who is Typically Responsible For Toxic Waste? Unlike the lawsuit that the Fort Myers residents currently have against the city, much of the time, toxic waste originates because of big corporations that fail to utilize proper safety precautions in the course of using, transporting, or disposing of toxic chemicals. These corporations usually retain their own attorneys whose job is to fight any lawsuits brought as a result of this behavior and ensure that the company has to pay as little as possible. This is why it is so important that you have your own legal team to fight for you. Have You Been Injured as a Result of Toxic Waste? We Can Help You Make Clean Them Clean Up Their Act. 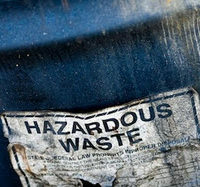 If you or a loved one has been injured as a result of exposure to toxic waste, contact us today. The Fort Myers personal injury attorneys at The Pendas Law Firm are experienced in helping people like you recover the compensation that you deserve. Contact us today to schedule a free initial consultation. The Pendas Law Firm also represents clients in the Fort Lauderdale, Miami, Orlando, Tampa, Jacksonville, Daytona and Bradenton areas.